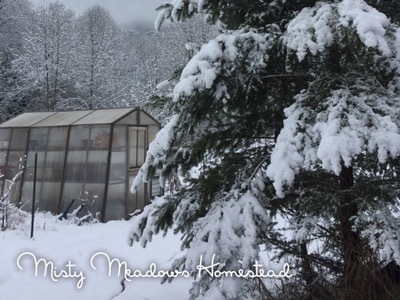 In the Garden – Grow a Year’s Worth of Produced – Misty Meadows Homestead & more! My grandpa was a Midwest farm boy and even after he grew up and made a life for himself in southern California, the farm boy never left him. He always had a garden and much to the annoyance of his neighbors (and the county) he had bees and chickens too. It was in his blood, much like it’s in mine. Snow still covers the ground and I am truly enjoying it, but a place in my heart is beginning to warm, longing for spring. It doesn’t help that my mailbox has been filled with seed catalogs. I’m already beginning to draw out plans for the new garden space and thinking of sweet treats I can make to bribe…err…reward Mr. Misty for his hard work and help with tilling and building garden boxes. [That was 2017. 2018 the weather has been SOOO different. We had snow for a couple of days around Christmas and that’s it. What we have had is rain… lots and lots of rain. Due to some health issues, my poor greenhouse in dire need of some cleaning before it will be ready for seedlings and because we had so many more pressing projects, we never got the garden boxes up and were lucky to get the ground tilled in time for planting. I’m also trying to calculate how much produce my family consumes during the year and how much of that I can potentially grow myself. This year will be my 6th year gardening and for the first time, I am gardening with the goal of providing at least 50-75% our needs. How many seeds will need to be sewn, how many plants planted and what will those efforts yield? Based on what I have already learned from my previous gardening experiences and from fellow gardeners, I have a general idea. When planning a garden, there are several things to take into consideration, like how much room you have for a garden, what crops grow well in your area and really important, which veggies will your family actually eat? If they won’t eat Kale and Brussels Sprouts, don’t waste your time planting and tending them. The following is a rough estimate of how many plants needed to provide a sufficient amount of produce for each person in a family. If you plan on preserving your harvest by canning, dehydrating, freezing or freeze-drying, you’ll need to add a few more plants to the total. Don’t stress too much about it – you might not plant enough or too much, just make notes for next year. These numbers will vary based on your family size, individual tastes, diets restrictions, and allergies. Even your climate plays into these numbers as some plants grow better in warmer climates than they do in cooler climates and visa versa. That information should be available on the outside of your seed packets and in your seed catalogs and is based on the USDA Plant Hardiness Zones. Another thing to consider is spacing. If you plant 10 heads of Lettuce and they all mature at the same time, will you be able to use them or will some go to waste and eventually end up in the compost pile? That’s what tends to happen to me. This year I’m going to start spacing out many of my planting’s by a week or more; example: plant 3 this week, plant another 3 next week and so on. Now you know many plants you need, do you know how much space you need? If you use a technique called Square Foot Gardening (SFG), you’ll need less space than with a traditional garden. 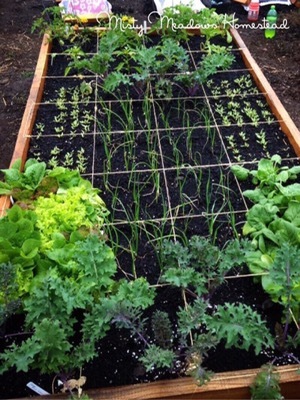 Mel Bartholomew, an engineer, coined the term “Square Foot Gardening” in his book of the same name. You can purchase the book or if you’re cheap like me, visit Mel’s Website or google “Square Foot Gardening” and you will find a plethora of information. A previous year’s attempt at Square Foot Gardening – it was very successful! Basically, two to four 4×4 foot plots will be enough to provide fresh produce for a family of 2. Remember, if you want to preserve produce for later use, you will need to plant a few more. And, don’t forget to plant some herbs – you’ll want to spice up the wonderfully healthy meals you’ll be making your family with your garden fare! Are you an experienced gardener? We’d love to hear from you! Please feel free to share your suggestions and tips in the comments below. If you like this post, please feel free to share and please click the follow button on the side or return to Misty Meadows Homestead to follow our adventures. Thanks! I desperately want to try my hand at growing food this year. I’m going to have to start with some easy things, though. I can’t wait! That’s how I started and every year my confidence and curiosity grew. Good luck and let me know if I can hep!! Fascinating. I never realized how many plants are required to feed one person. Good luck with your gardening adventure. It is a wonderful idea. I know Gary. I have a brown thumb and can’t grill everything but bamboo plants. From dream big, dream often, the blog. I like the list of how much per family member. I can never get a good answer on that, and I know it’s subjective, but still. We have a similar production goal. As much food for the family as we can. I don’t know that we’ll ever reach 100% or want to, but I would love to get closer to 85% eventually. Best of luck with your planning! Wonderful! I’m glad this was helpful to you. Check out our new blog for a great tool for gardeners just like you! 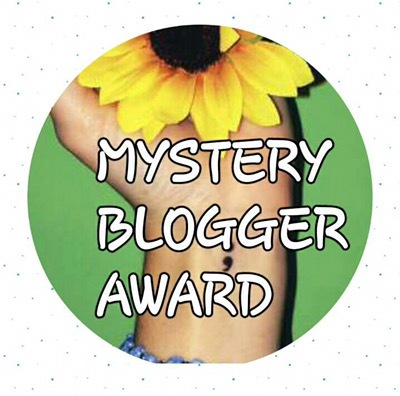 Thank you so much for this post! I’ve been looking for something that could give me a round about for what I need to be planting. I’d like to do much like you and provide about 75% of our fruits and veggies from our own garden and this post has been very helpful! I’m glad to hear the post was helpful. You might check our recently post. We’ve created a great tool just for gardeners like you!! Great list! A lot that I haven’t even thought to give a try! Thanks for sharing on the Homesteader Hop! Glad to see you!! The hop is always fun and I always find so many good posts to read! Pingback: In the Garden – Viability of a Seed – Misty Meadows Homestead & more! Pingback: In the Garden – Lifespan & Viability of Seeds – Misty Meadows Homestead & more! Thank you! What an honor to be included! Thank you so much!! That is such an honor! !